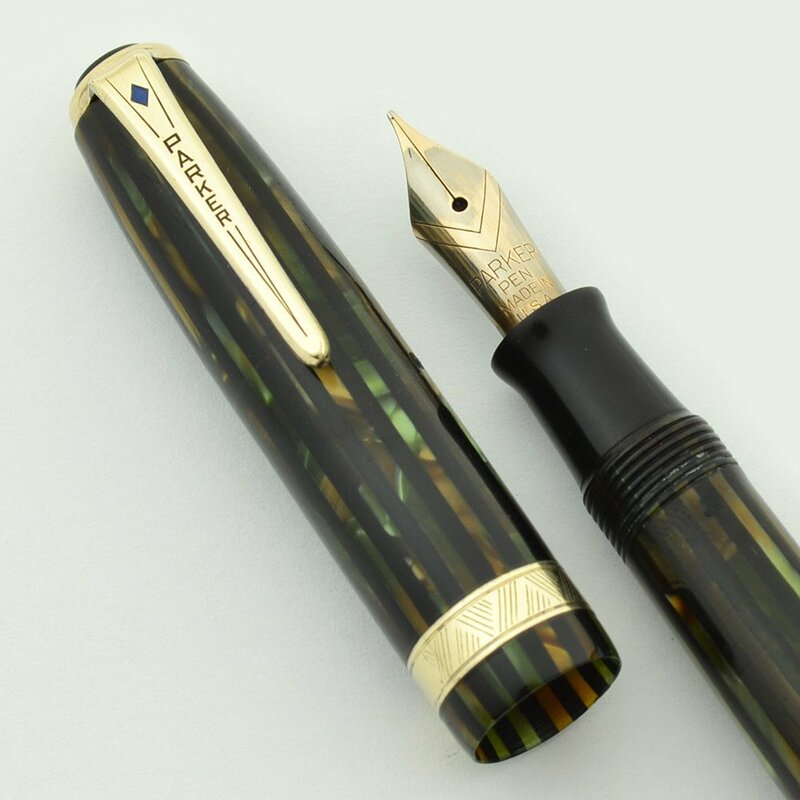 Parker Duovac Duofold Vacumatic fountain pen from 1943. This is the smaller of the two sizes, the Ingenue. Vacumatic filler in the green, black, and gray striped color with gold plated trim, a blue diamond, and the "chevron" style cap band. 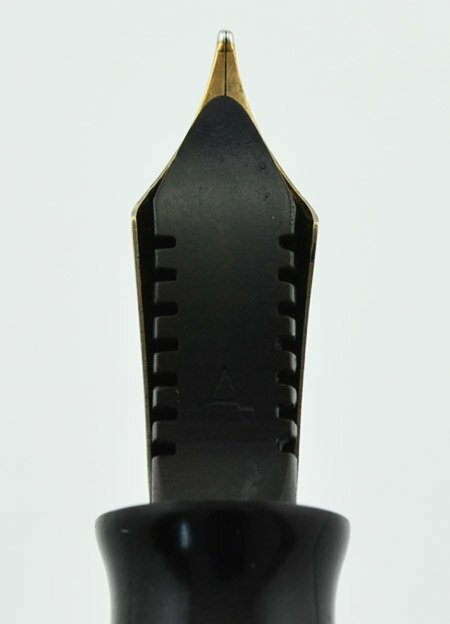 Fine two-tone gold nib is smooth. Excellent + condition with some marks of wear, fully restored and working well. Type Vacumatic filling fountain pen, restored and working well. 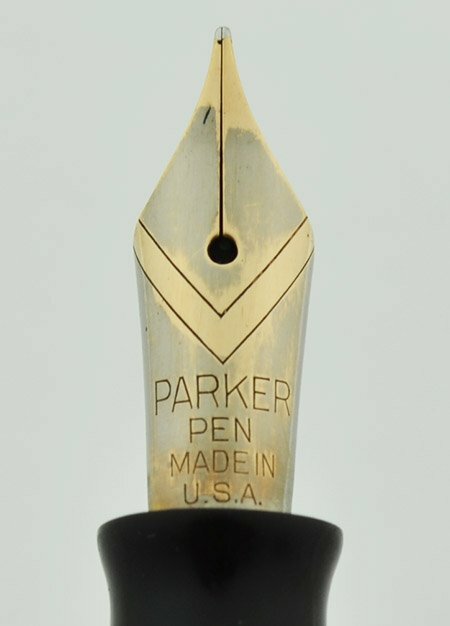 Manufacturer and Year Parker, USA -- 1943 (The date code is a clear 3 with no dots). Length Just a hair over 4-3/4 inches. Filling System Standard plastic Vacumatic filler. We've fully restored and tested it, it's working very well. Color Green, brown, and gray stripes alternating with transparent green and yellow stripes. It has a blue diamond clip, a black cap jewel, and a "chevron" style cap band. Nib FINE two-tone gold nip is smooth with nice tipping material. It has a bit of give to it. The silver colored masking is very thin and has worn off completely on the tines. Condition Excellent + condition, with great trim. There's a few marks of plating wear on the cap band and on the tassie around the cap jewel. The cap and barrel have some light scratches but no major markings. 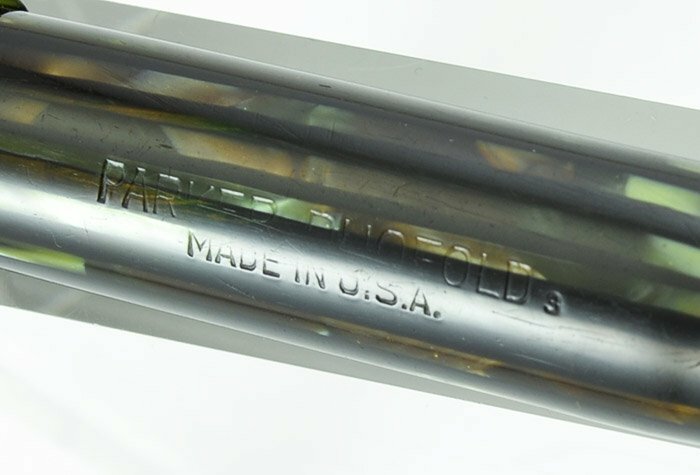 The barrel transparency is good but the two tone nature of its transparent portions imply ink staining. The imprint is legible. There are no cracks or chips, dings, dents, or personalization. The pen has been fully restored and it's working well.